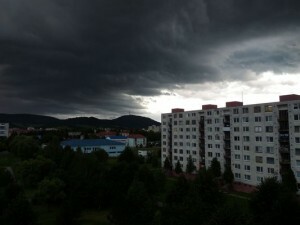 Poprad. When people hear the name of town Poprad, they usually think of the High Tatras. Yes, for many Poprad used to be the main gate to the highest mountains in Slovakia. 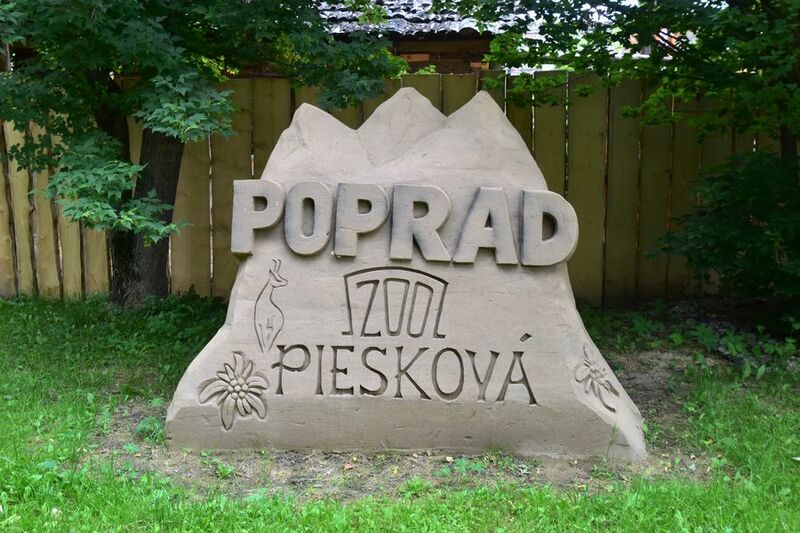 Unfortunately, many tourists just pass through Poprad thinking there’s not much to see and they go directly to the Tatras. But I can honestly say it’s a big mistake. Poprad with approx. 50,000 inhabitants has a lot to offer. Church of Saint Egidius, Kostol Svateho Egidia in Slovak, is the main church situated in the Poprad city centre. We don’t know exactly how many years it took to build it but we do know that it dates back to the second half of the 13th century. The Renessaince bell tower next to the church was built in the end of the 16th century by local people and also a group of Italian masters. Building separate bell towers next to churches was very common in the Spis region in Eastern Slovakia. It is a Roman Catholic church now but it used to be a Protestant Evangelical church. From the name we can guess that the church is dedicated to Saint Egidius. St. Egidius was the patron of beggars, hunters and forest rangers. He was born in a very important family in Athens, Greece. His family was not happy with him giving away their wealth to the poor so he left and started living in a cave with a doe. We cannot find any Gothic altars nor Baroque inventars in the church. 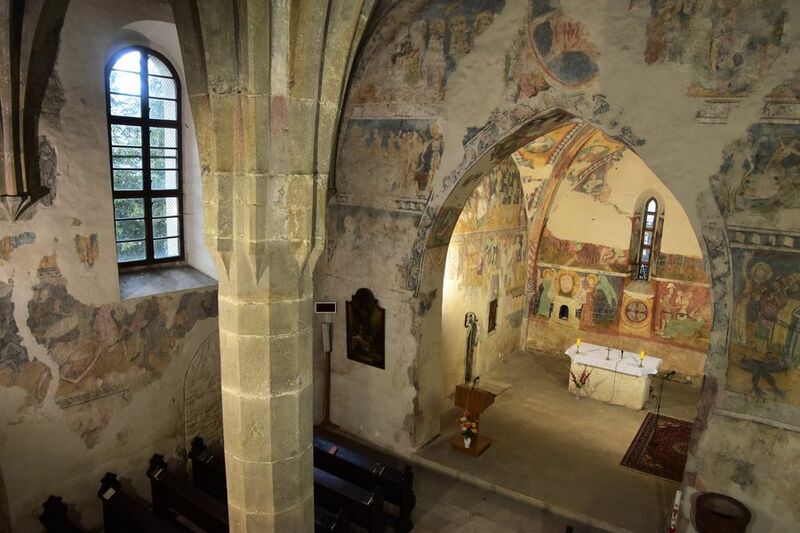 However, we can see how churches would look like back in the 13th century usually with a lot of frescoes (wall paintings). Painted walls were a sign of prestige. In 1990’s the frescoes were still covered up with white plaster and only then they were restored to beautiful colorful frescoes we can see in the present. 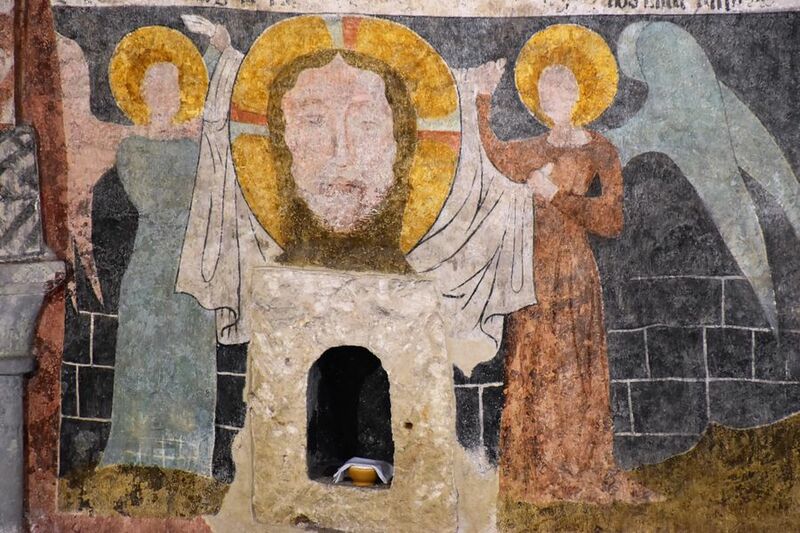 The frescoes are 500 to 600 years old, and all remain original, just restored. In Middle Age very few people knew how to read so all these frescoes were representing parts of the Bible. It is a Gothic church but we can see only 2 Gothic windows and the other ones are Baroque. 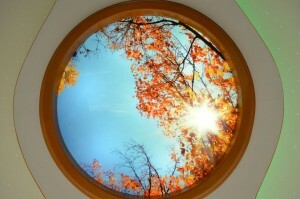 Below the central window there is a cross in a circle. Originally, there were a few of those crosses in circles painted all around the church. It’s interesting that the Baroque pipe organ looks like marble but it is made of wood. The pipe organ with painted angels was found in a different place and moved into the church. The inner musical instrument is new but the outside box is the original one. St. Valentine is pictured on the left side of the main Central window and on the right side it’s St. Egidius. There’s an old door which was the entrance to another chapel of St. Valentine which was standing there until the 17th century. Till the end of 20th century there was also a Baroque altar. Another curiosity in the church is the copy of the Madonna of Poprad from 1484 (the original Madonna is in SNG gallery in Bratislava). The church was totally damaged in the WWII and the Germans wanted to blow it up with a dynamite. Thankfully, the church still has the original roof but many other parts were reconstructed. 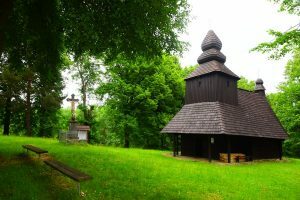 The Church of Saint Egidius in the heart of Poprad is completely different to the Church of St. George in Spisska Sobota even though they both date back to the 13th century. So I really recommend you to pay a visit to both of them, just to see the difference. There’s a mass 6 days a week. But if you’d like to see the church and find out more about its history, just go to the MIK info centre office on the main square to book a guided visit. You can join a guided visit tour every day at 3 pm or book a private one at any time if you come in a bigger group. Poprad town consists of 5 parts, which were 5 separate villages/towns in the past. Now they all form one town called Poprad. One of them, probably the most known one is called Spisska Sobota. It has a lovely square with a nice park, many picturesque burgher houses from 14th and 15th centuries and Romanesque Church of Saint George from the 13th century. Strolling around Spisska Sobota main square is like going back in time. 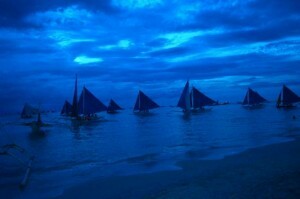 I will never forget the calming energy I felt there. Town Monument Reserve in Spisska Sobota is so romantic! 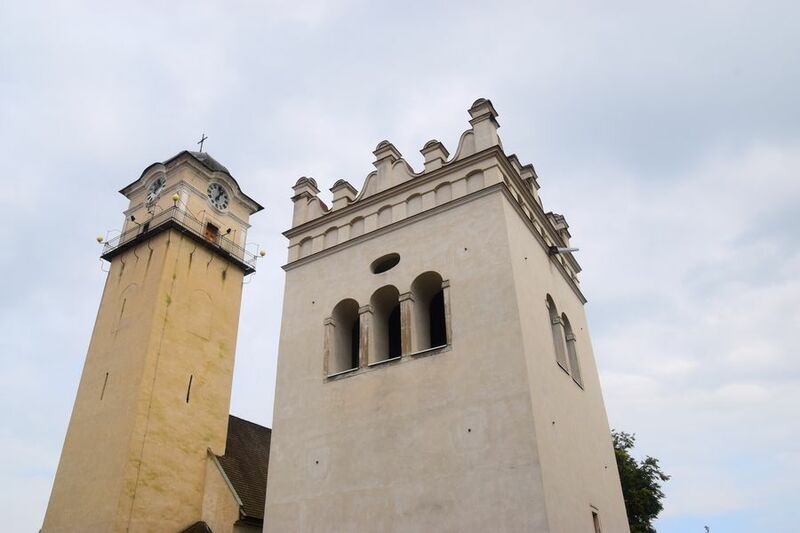 Many churches are in Poprad because it’s a combination of 5 towns and each would have 2 or 3 churches before. Poprad Museum Podtatranske muzeum v Poprade is one of the oldest museums in Slovakia and the oldest one in Presov region. The building was built in 1885 and 1886. In front of the museum we can see a statute of its founder David Husz. 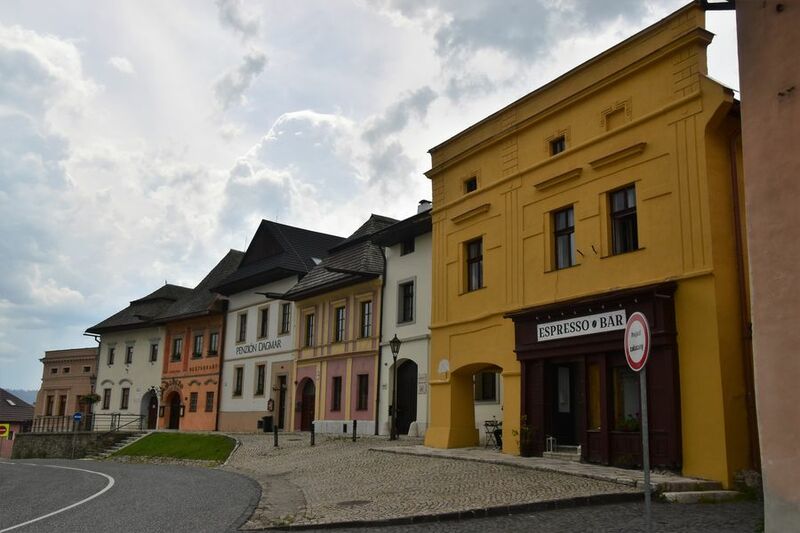 The current museum has two exhibition locations, one is in Spisska Sobota (exposition showing burgher houses), while the second one is next to the main square in Poprad. The latter one is the main exhibition building showcasing Poprad and its surroundings from prehistory to the present time. 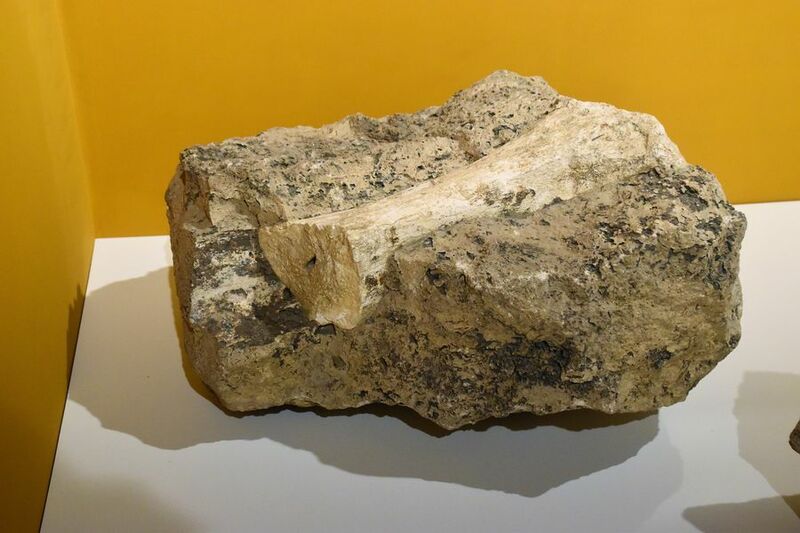 When travertine was extracted in Ganovce (a part of Poprad) many fossils were found there, such as fossils of snakes, mammoths, deer, plants, trees, etc. Also leg bones of two other neanderthal people were excavated in the area. 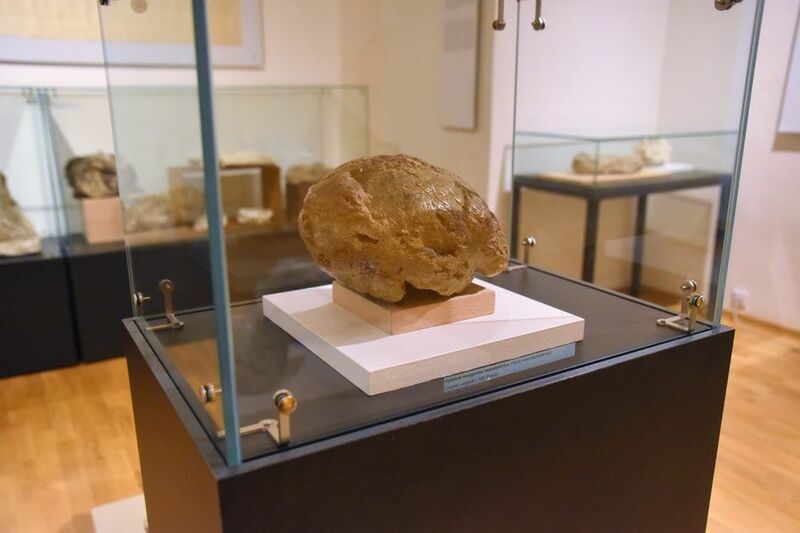 In the museum we can observe a cast of a neanderthal woman which was excavated in 1926. We suppose that the woman fell asleep there because of the smell of strong mineral water. Mineral spring and the mud there helped to conserve the woman’s brain for 105,000 years. The copy of the cast is located in the Podtatranske Museum, while the original is in Prague in the National Museum. The museum holds also other important artifacts, such as Celtic artifacts from 450 BC to AD (e.g. a Celtic helmet) and many artifacts from the Bronze Age found in Matejovce. Of big importance is a thomb of a German Earl which was excavated 5 metres below the surface full of water. It dates back to the end of the 4th and beginning of the 5th century AD. A thomb like this has not been found in a similar state anywhere else in Europe yet. The wooden thomb was made of red spruce tree. A golden pendant of a Roman Emperor from the 4th century AD was found inside the thomb. Since 2008 the outer part of the wooden thomb is in Germany where they are still examining it. In the museum visitors can observe also many coins from the Austro-Hungarian Kingdom. There’s even 20,000 books in the museum archive but just 20 out of them have been restored. The oldest book from the museum collection dates back to 1607. Other important artifacts found in the museum are a wedding coffin, a local map from 1867 and a wooden Ninera musical instrument which looks like a big violin (it’s one of the oldest original ones in Slovakia). Don’t forget to have a look at the so called Kamadulska Biblia from the end of the 18th century. It is the copy of the first translation of Bible into Slovak and it was was written on a paper produced in one of the 3 Poprad paper companies. 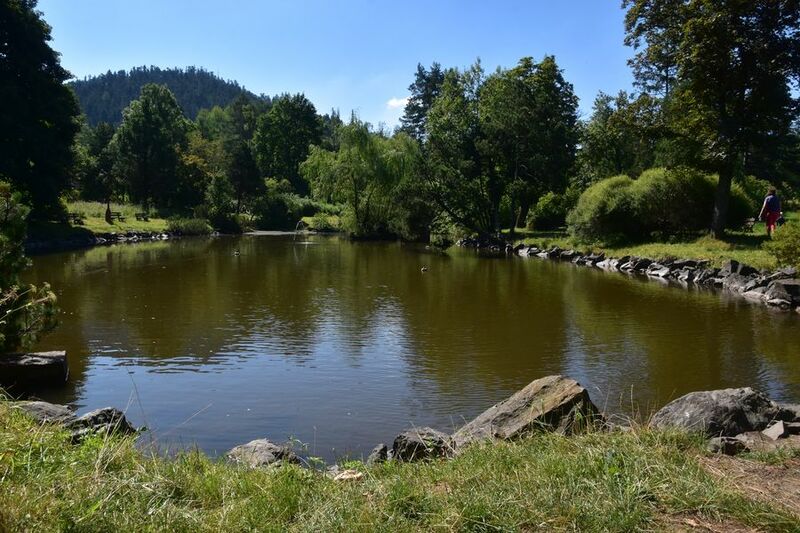 Let’s move from the city centre to the nature just outside of Poprad. 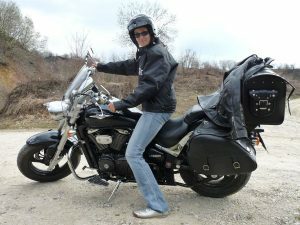 For bike enthusiasts, I found a cool biking route from Poprad to Kvetnica. Kvetnica is a cute little village with just 200 inhabitants situated in the outskirts of Poprad. It’s just a few minute drive from the city centre. The views of the High Tatras mountains will get you when cycling. 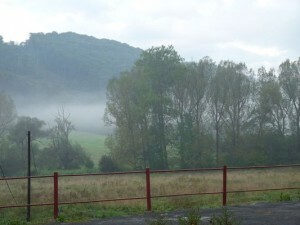 I was astonished and could not stop looking at the mountains! 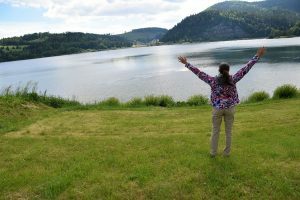 Cycling to Kvetnica is not the only thing to do there. The village is known for a small picturesque lake with ducks and a fountain, and a nice park next to it. There’s a Church of Saint Helena and a chapel with a small route with stations of the cross also located in the park. It’s possible to walk along the educational hiking path learning about Slovak vegetation and visit Zamcisko archaeological area. The whole Kvetnica seems like a very relaxing area, let me tell you. 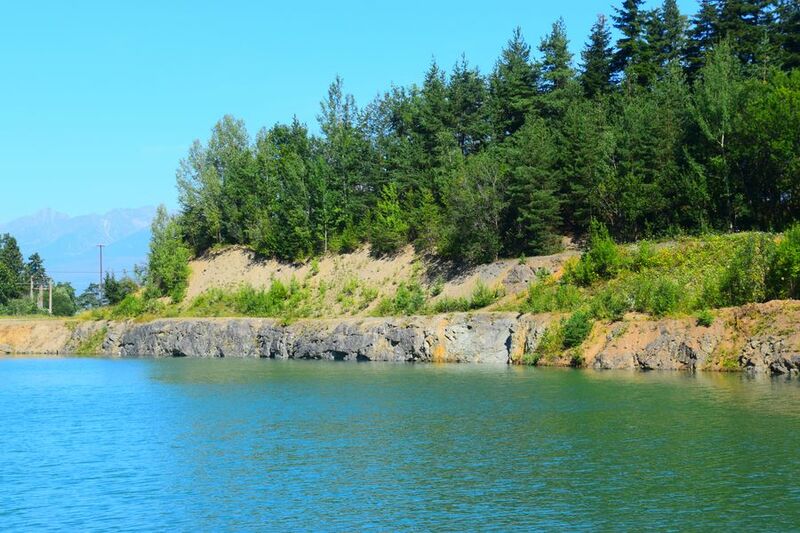 Aw and there’s a beautiful water quarry close-by too. It’s forbidden to swim there but you can go for a walk around, have a picnic or just enjoy peace and quiet there. 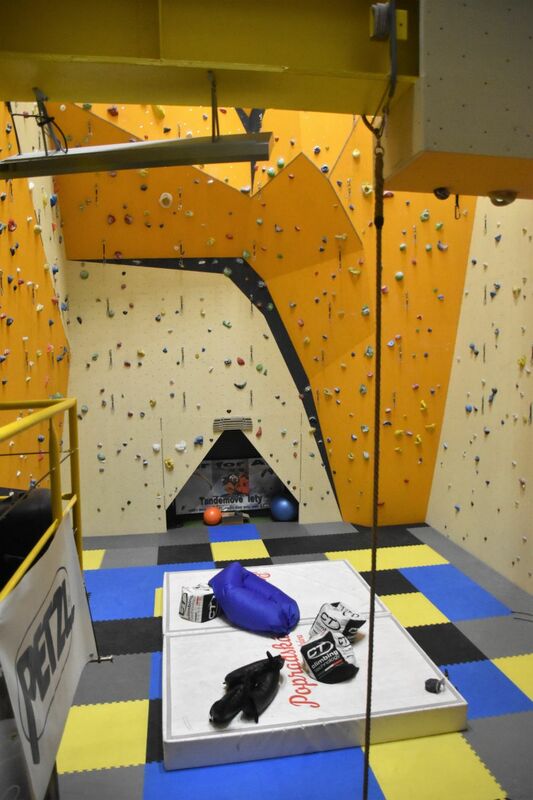 If you are into adventure and enjoy rock climbing, then you should definitely go to Woodrock Poprad, a new climbing place which opened in 2017 only. It was a place where they would make concrete. Now there is a rock climbing wall inside with a coffee shop on the first floor. There are different kinds of climbing you can try. It’s almost 31 metres but not all is available for rock climbing yet. 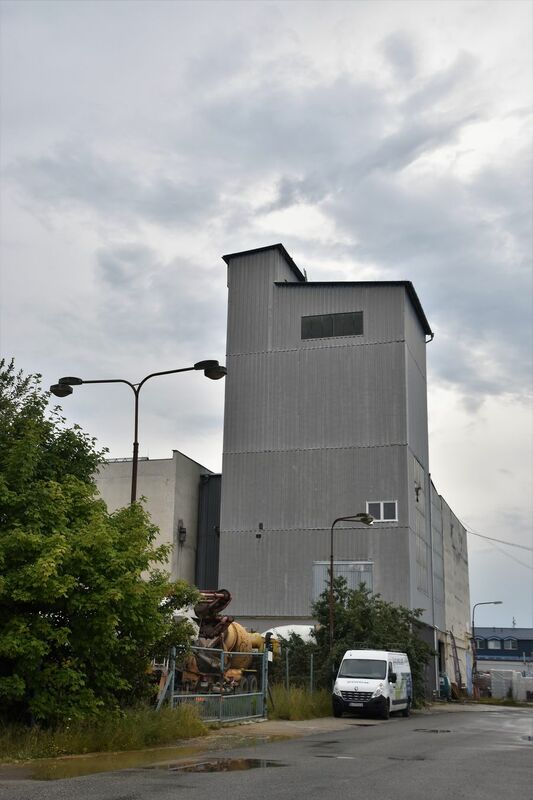 In the present you can climb up to 13 metres. If they will finish the whole wall, it will be the tallest indoor climbing place in Central Europe. It is so unique! I’ve never been to a climbing place like this. It’s not expensive at all and if you’d like to hire a guide to show you how to climb for the first time, it’s possible 🙂 Here’s more information about Woodrock Poprad. 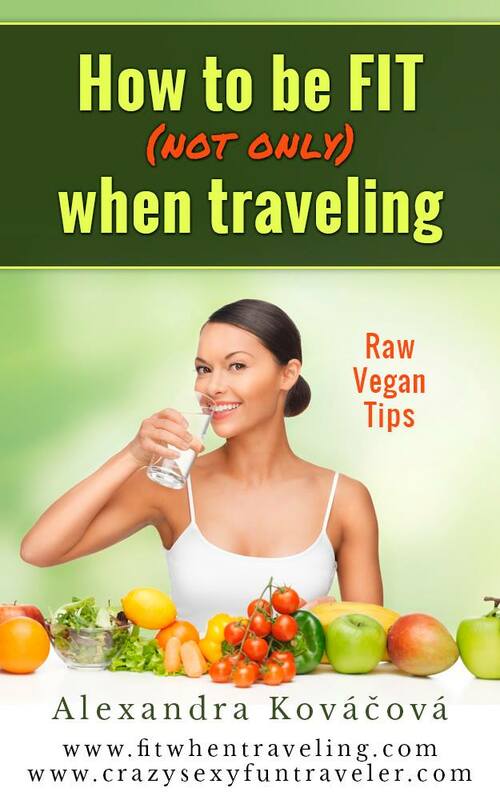 And what to do after climbing or cycling? 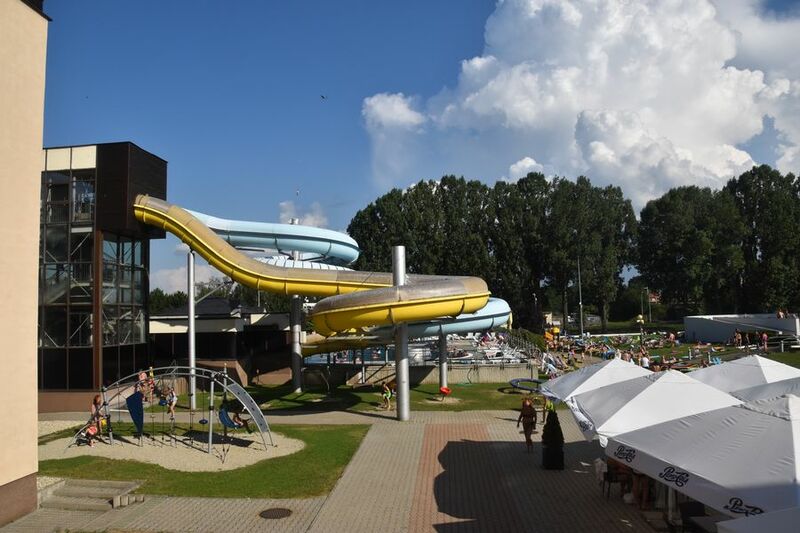 I suggest you to relax and have fun in Aquacity Poprad. If you love toboggans, you won’t want to leave, trust me! 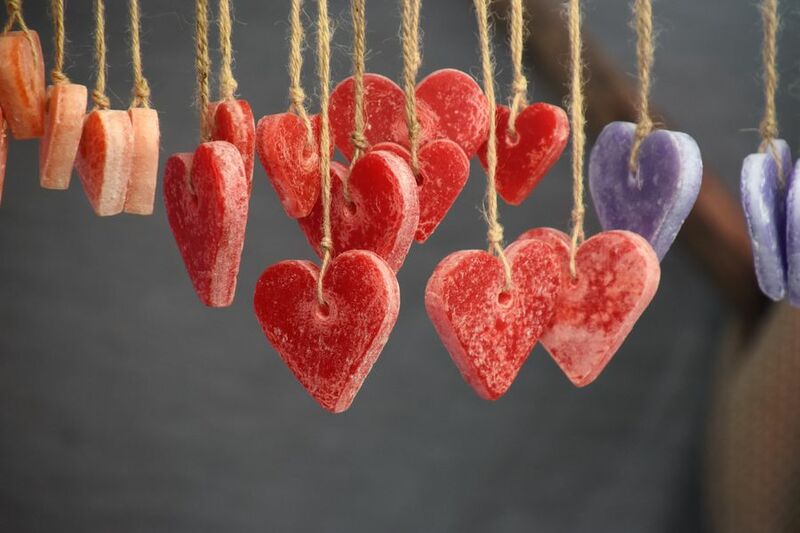 But there’s much more to do, you can go for a swim, chill in hot water pool, sunbathe if weather allows, or even sweat all the toxins in one of many saunas in their wellness centre. 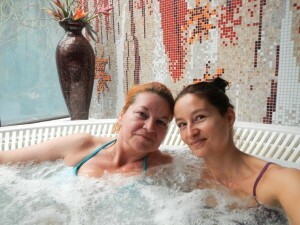 I have to say that wellness in Aquacity is awesome, way better than I expected. It’s spread on 2 floors, and you can take rest in jacuzzis, water bed, different kinds of saunas (infrared, steam, salt, herbal, dry Finnish) and sunbeds. And they even do sauna rituals there. I participated at two of them, one in a dry sauna and another one in steam. They were very different from each other but I really enjoyed both of them. An unforgettable experience! And yes it’s possible to book a room there at one of the hotels that are part of Aquacity. 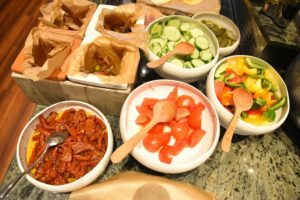 I’ve stayed there 3 times already, once in Hotel Seasons, and twice in Mountain View. Mountain View hotel, as you can guess from the name, offers rooms with the view of the High Tatras mountains. 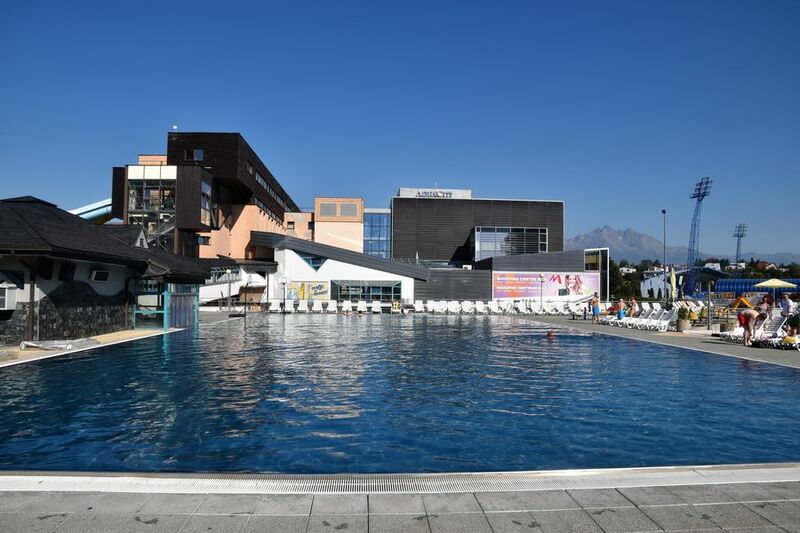 Here’s more about Aquacity Poprad, both aquacity and the hotels, too. 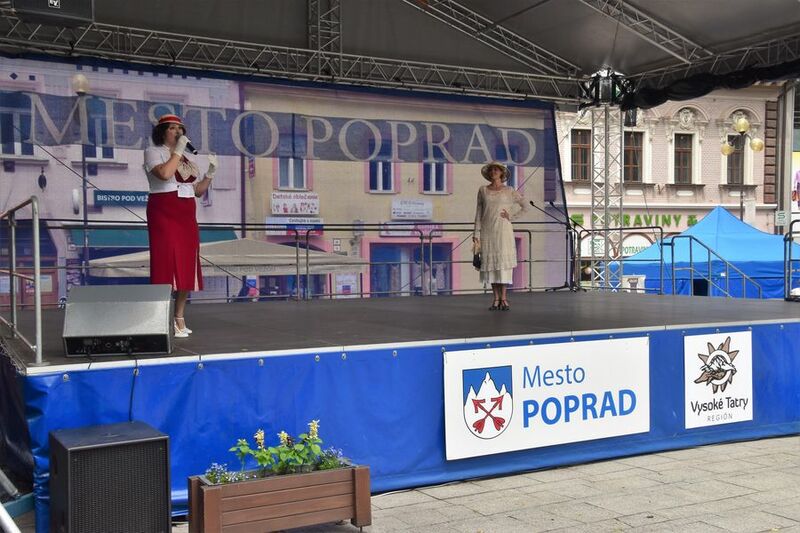 Poprad is becoming famous for many summer events which take place at the Square of Saint Egidius in the city centre. It seems there’s a different event taking place every weekend in July and August. 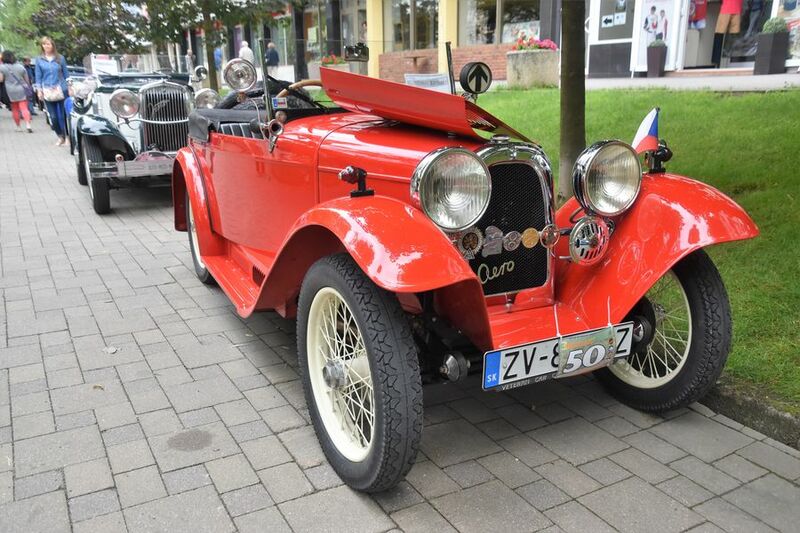 I attended a couple of them, and could see old veteran cars at Tatra Oldtimer event, fashion show from early 20th century, concerts of different musicians, pottery making, etc. 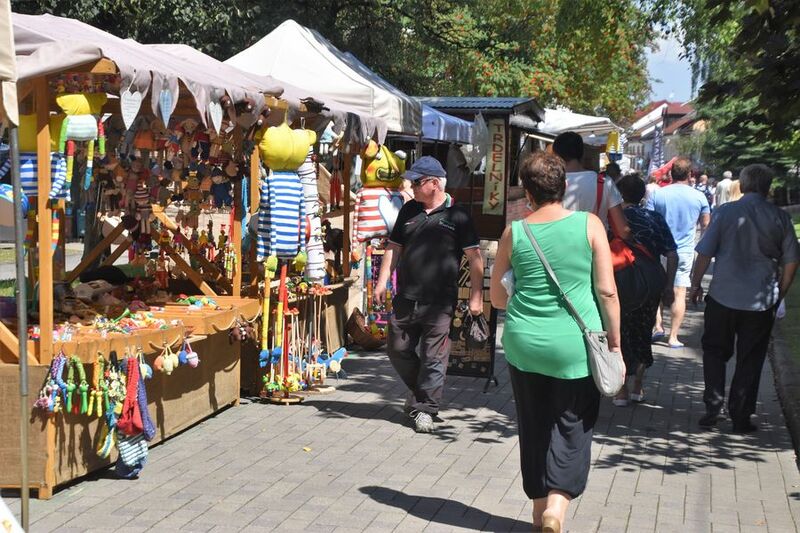 The biggest event is probably Made in Slovakia where you can buy local products made in Poprad and the rest of Slovakia, and also listen to Slovak musicians. 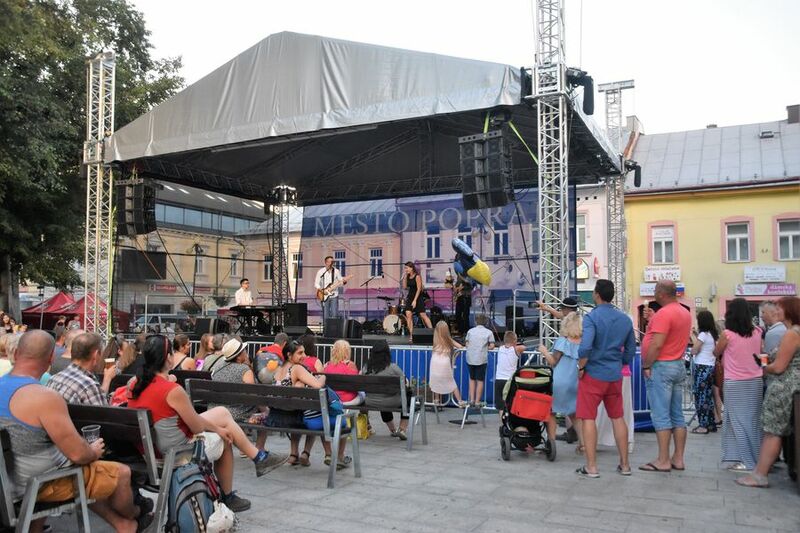 Usually Poprad city centre feels relaxing but during concerts at Made in Slovakia it was crowded. What a different feeling to see so many people there listening to free concerts! Another event you might be interested in attending is the International festival of mountain movies which takes place in Poprad in October each year. It’s organized by Peter Hamor, famous Slovak mountaineer who climbed all the 14 Himalayan peaks higher than 8,000 m above sea level. Those 14 peaks are known as ”Crown of Himalaya”, or eight-thousanders. Ice hockey is the main sport in Poprad. The local HK Poprad ice hockey team plays at the big stadium close to Aquacity. Poprad is famous for The Tatra Cup (Tatransky pohar in Slovak) which is the second oldest ice hockey tournament in Europe, and at the same time the oldest one in Slovakia. 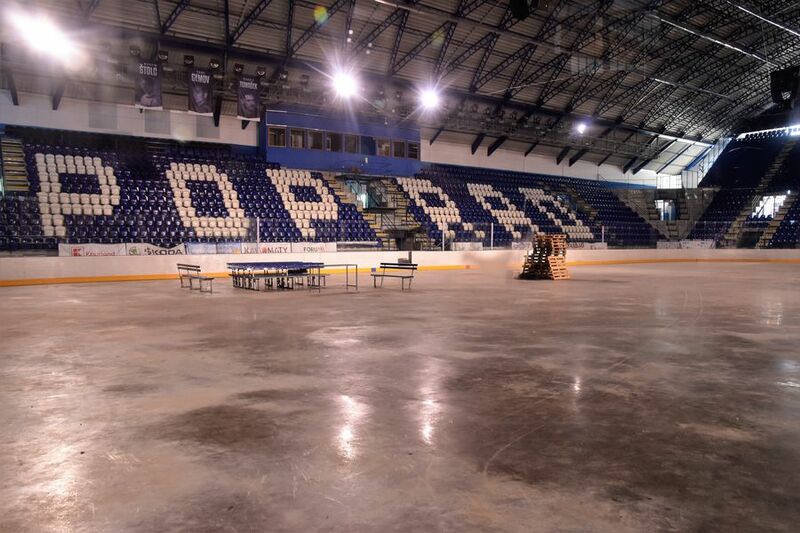 Many different hockey teams go to Poprad to play there. In 2018 it was already the 71st year played. I had a chance to visit the stadium on an off-day and take a photo with some of the players 🙂 Very weird not to see the guys playing but to look at the empty stadium. Next time I hope to go there during an ice hockey match to have a lot of fun. More about HK Poprad ice hockey can be found on their website. Scherfelov dom is nowadays Museum and Gallery. The house was owned by Aurel Scherfel, a well-known local chemist, scientist, pharmacist and humanitarian who lived in Velka (1 of 5 parts of Poprad) from 1835 to 1895. Aurel inherited a pharmacy from his father and worked there until his son died when he was 20. Most probably his son died of diphtheria caused by a bacteria in water which is why Aurel sold the pharmacy and started to analyze water springs of upper Spis region. He analyzed in detail up to 20 springs and all they contained. Mr. Scherfel spent all his life dedicated to science and helping local people with local herbs that he picked in the High Tatras mountains. He died on his 60’th birthday. 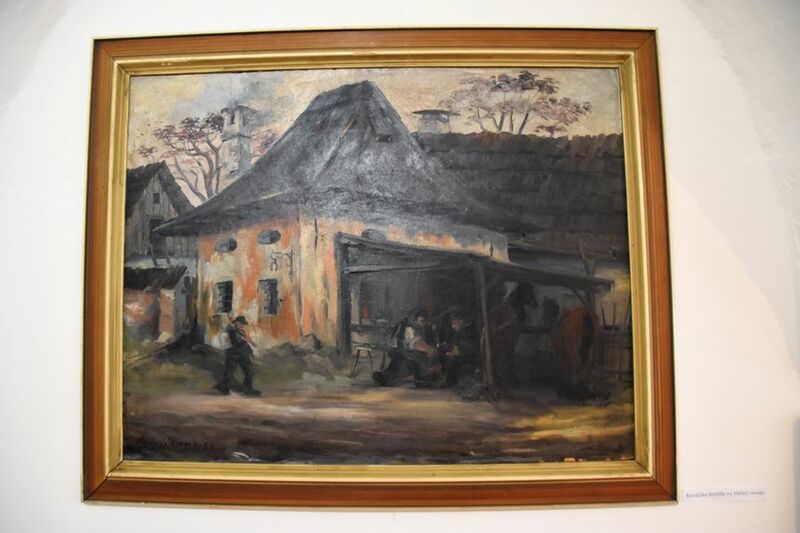 According to Aurel’s last will, his house had to serve to kids in a way which is why it was sold during the Communist era and a school was formed there. Since 2008 it has been restored and opened as the Museum. 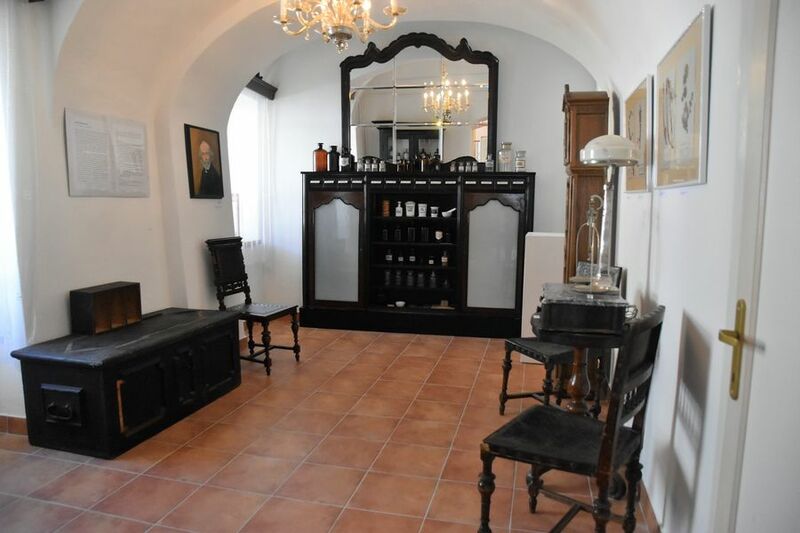 In the Scherfel’s House Museum we can see Scherfel’s flower and herbal herbariums, scales, and other artifacts from his pharmacy, and his last will is also located there but in the archive. With his last will Aurel also left 2,000 coins to build a hospital or a water duct which were later used to build a water pipe in the area. One part of the Scherfel’s House is the museum, while the other part on the right side is a small gallery with permanent and temporary exhibitions of local artists. The permanent exhibition holds paintings by Ondrej Ivan on which we can observe how streets would look like in the past. Most of his paintings take us back in history because those streets do not exist any more, or they have been completely transformed over centuries. There’s free entrance to the Museum on working week days from 8.30 am to 4.30 pm. 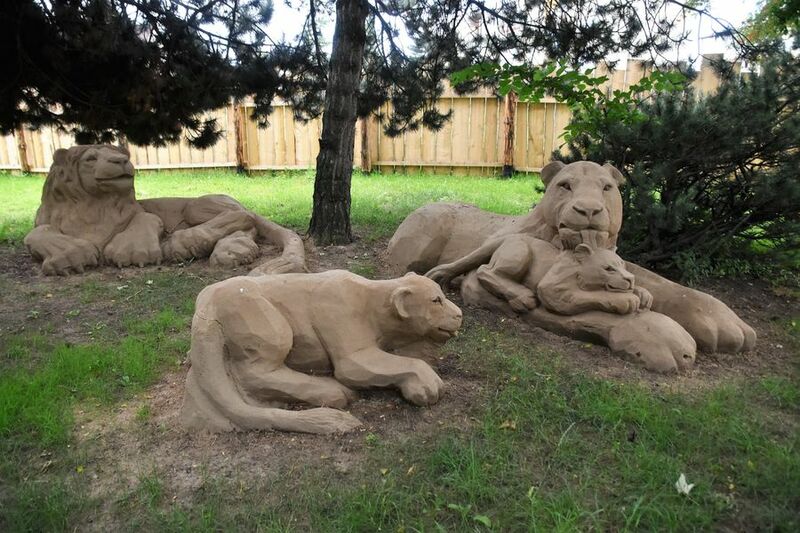 There’s a small fee to enter the Sand Garden ZOO. 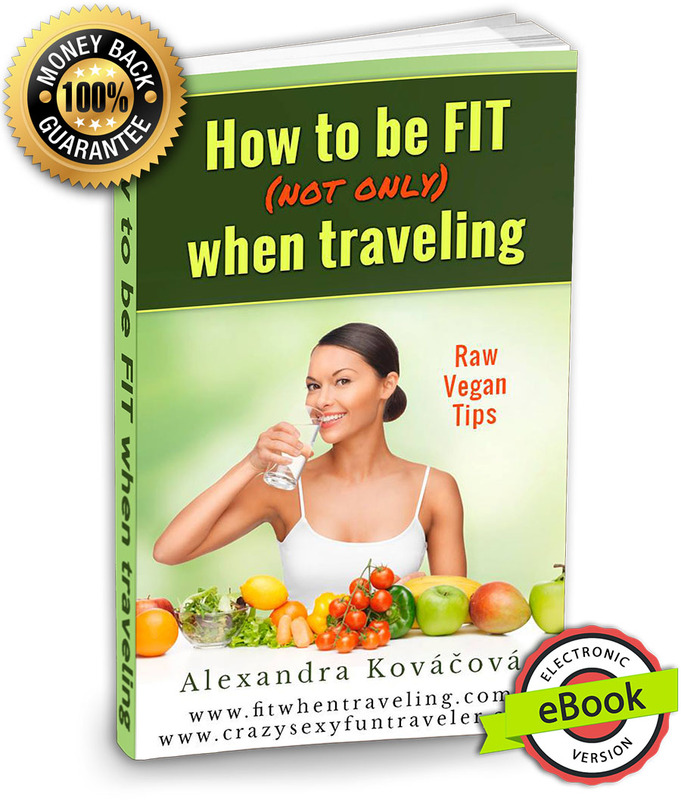 And from Slovakia or Poland you can just go to Poprad by car, bus or trains. There’s quite a lot of options as Poprad is located on the main way connecting East and Central Slovakia. Big thanks for a lovely trip to Poprad. For more information about Poprad, check Visit Poprad website. 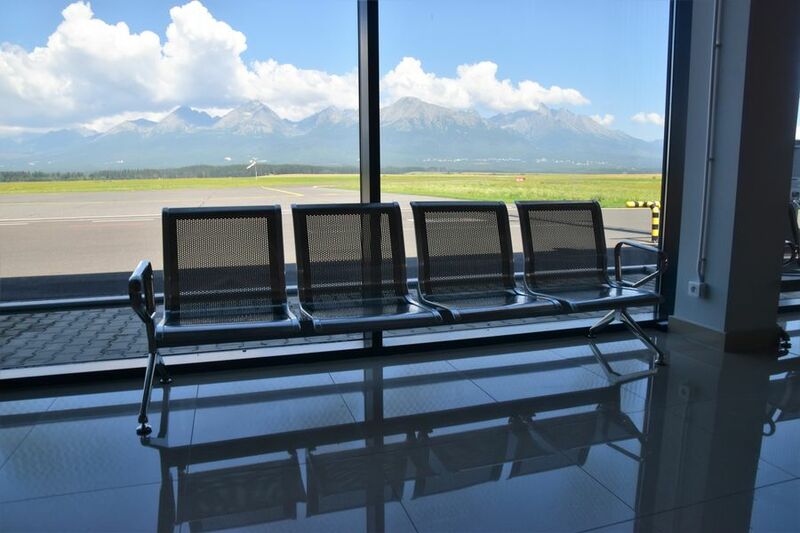 Did you know that Poprad is located in Region High Tatras? If you are looking for tips about what else to visit in the area, have a look at Region Vysoke Tatry website. Nevedela som, že v Poprade je toho toľko pre turistov. A tie cyklo trasy vyzerajú zaujímavo s takým krásnym výhľadom. ..no teda, tak o tej pieskovej zoo som ešte vôbec nepočula a vyzerá to celkom zaujímavo ? ?